You may be wondering what makes me qualified to write such a report such as the title of this post. Well, let me explain. I run an outsourcing company called The Offline Assistant. My company provides access to my team of staff members who perform a series of tasks for my customers. These tasks range from Social Media Management, to graphic design and cold calling, mobile and app development and lots more. We also offer Virtual Assistant services to people who need a qualified, reliable Virtual Assistant service (my hiring process is ridiculously thorough). The services depend entirely on what the customer wants. Some links listed in this post may be affiliate links. Should you purchase through any of my affiliate links I may benefit from that purchase financially (that’s what they’re for, right?). So, if you do decide to buy any of the tools I mention and you use my links then I’m a) extremely grateful to you for buying on my recommendation and b) if we are ever in the same city I’ll buy you a drink as a thank you. Originally when I was looking for new customers it would involve me partnering with someone who had access to a customer base who may be interested in my services. This is always a good option, however, splitting commissions can become expensive especially when running a service business such as my one. So, I wanted to find a way that I could streamline the whole process of finding and educating a prospect without me getting involved… the holy grail, if you will. That search led me to Facebook ads where I drive people to a landing page and then onto an automated webinar that would integrate with an autoresponder. Perfect. Before I dive into the method take note. This method is easy to do and works really well for me. However, you may feel overwhelmed when reading through the report what with all the moving parts involved. I promise you that it’s not complicated. It just requires some elbow grease and an understanding of your product or service. Have these in place and a few hours of time and you can be up and running the very same day. However, if you’d rather have some help then I have a way you can get that help, which I detail at the end of the report. I’ll also share the link to my webinar registration page so you can experience it. From a 30,000 foot perspective here’s how the FBWebiCall method works for me. Someone sees my ad in their Facebook News Feed. They click on the ad as it has some potential interest to them. They see the landing page and wanting to know more they register for the webinar. They watch the webinar and if interested in my service book a time to talk with me. So why am I speaking with people on the phone rather than just enticing them to sign up on the webinar? That’s a good question. For me, I’d rather ensure that the person joining the program is a fit 100% and that their expectations are met from the outset. I’d rather know that my company CAN help them rather than taking their money from them and then finding out if I can help. It makes my life easier building a relationship and providing value for someone who’s interested in my company and services and in turn I get to hear more about their business and what they may need specific help with. The best things in life are free… But in business you have to pay for these things IMO unless you can build them yourself (I do make software). But this particular funnel setup requires some paid for tools. I’ll detail below the tools I use that allow me to run this system automatically. I simply turn on my Facebook ads when I want new appointments. So, let’s begin. 1. Facebook ads (obviously). You need a budget in place in order to pay for your ads. Starting from as little as $5 a day and add more funds as you need more webinar registrations (assuming you have your ad tweaked and working right for you). TIP: If you’re getting lots of clicks on your ad but few webinar registrations then your landing page needs some attention. 2. Lead Pages. I love this platform. It provides easy to build landing pages that look great. It seems to be the industry standard as most online marketers appear to be using it. TIP: You can sort the landing page options inside Lead Pages by highest converting! A nice feature available to you to find the current best converting landing page. 3. Google Drive for the presentation. I create my Powerpoint Presentation from inside Google Drive. It’s free and does the job nicely. 4. Camtasia. I record my Powerpoint presentation along with my audio from within Camtasia. It’s relatively inexpensive but a requirement if you’re making lots of training videos from your computer. 5. The webinar platform I use is called Stealth Seminar. Setting up the system right the first time and you could pay for your entire usage for one or two years in just one go! There are other options out there for automated webinars but after doing my due diligence I went with Stealth Seminar. Sure, it’s got a monthly fee associated with it (not a lot mind you), but if you’re using automated webinars and you have something of value to offer your viewers then it will pay for itself very quickly! To continue reading the rest of this detailed report you can grab the pdf here (no cost). Disclaimer: This guide is for educational purposes only. I take no responsibilty for any consequences that may arise from using this guide. Please note, these same principles you are about to learn can be applied OUTSIDE of the recruitment industry. I merely used recruitment to serve as an example. Imagine waking in the morning to find you’ve had a score of potential candidates view your linkedin profile. How easy would it be to now contact them? Look at the image above. Looks like a great way to make a warm introduction, doesn’t it? All those lovely “Connect” buttons in order to send an invitation to connect. Note, that screenshot above was taken from my personal account. There’s still thirty more below that, for today! It’s easy to do and I’m going to show you exactly how to do this over the next few steps. Read on to find out how. In a nutshell, you view peoples profiles, who in turn view yours. Look at enough profiles and more interested parties will look at yours. It’s really that simple. Log into your Linkedin Account and Click on the Advanced Search option in the top right of your account home page. Notice the orange arrow in the picture above – that’s where you need to click. Notice how I have the search in “quotes”. This is because I am looking specifically for a c sharp developer. Having the search without quotes may also return results based on things like c sharp, web developer, etc. I specifically want a “C Sharp Developer”. In this step you need to decide if you want results from people you may already be connected with or not, or people 2 or 3 times out from your network. Tip: Setting connections to 1st level will result in far fewer results than 2nd or 3rd level connections. For a broad set of profiles it’s recommended to select “All Linkedin Members”. Please note though the number of results you can view at any one time will be limited to your Linkedin Account type. The free Linkedin account will limit you to 100 results. If you find this too limiting then the correct way to maximise these 100 results is to then filter the Relationship connections in order to maximise your profile viewing capabilities. So you’ve set up your search parameters and your relationship levels. The next thing to do is click on Search. There are 21 profiles that meet my search criteria. So now we have a list of 21 potential candidates for the “C Sharp Developer” role you have on your books. All you now need to do is view each one of these profiles individually. What happens next? Well, these candidates will either receive an email from Linkedin (once a week) telling them that some people have been viewing their profile. The other option is that they will log into their Linkedin account and see that their profile has been viewed X number of times over the last few days. Inside those views is your profile view. If the candidate is interested to know more about you and who you are they will click through to look at your profile. They’ve viewed your Linkedin profile, what next? Well isnt this the hardest part of your job – finding the right candidate to fill your available roles? Now you have them viewing your profile! In this instance it could be taken as a warm lead that they are interested to know more about you, as a recruiter and potentially what roles you may have in mind for them. Reach out. Make an introduction to them. Let them know you’re aware they viewed your profile and that you may have something to offer them. Many profiles will hold the candidates contact information on it, whether their personal blog or email. You can also request more information from them on their profile as you can see from the image below. Also, it’s a great way to show them you’re interested to know more about them. But what if you don’t want to contact them that way? Well, there is another great technique you can use in order to get connected with them after they’ve viewed your profile. When you mouse over their profile you will see an option to “Send message” so now you can make your introduction there. Search for candidates for your relevant positions. View their profiles. Wait to see if they then view your profile in return. If they do then make your introduction – view their profile again to find their contact details. If they’re not on their profile try looking at what groups they are in and becoming a member in order to send them a message. This software will search profiles for you and view them for you automatically! To get the software all you need to do is visit this page and follow the instructions! So this morning I was working on a php script that would send an SMS to a predefined number upon page load. The idea being that when an order is placed, rather than checking on the inbox constantly for an order it would be more efficient to receive an SMS when an order is placed. Now, currently the “problem” of receiving too many messages isnt there right now. This is a high value item and we’d expect three, possibly four orders per day so receiving these notifications as text messages won’t be an issue. It also serves as a prompter for “take action” on the new order. how did I implement this? Simple. I used Twilio. Twilio have been around for a number of years and many large corporations use Twilio’s services in their sms and calling applications. So, I figured that integrating Twilio into my client’s payment flow wouldn’t be a cause for concern with reliability. You will need an account with Twilio, however you can obtain a free account in order to test and set up your php script. You’ll also receive some credit in your account too, along with a sandbox number to use. I found the instructions very easy to follow. However, I did have an issue with my Account ID details from Twilio. I Was copying/pasting and for whatever reason it created a space at the start of my Account ID which I didnt realise until about 30 mins in and some googling. So, ensure there are no spaces at the start of your Account ID when you add it to the script! Ensure you upload all the files to your server and add the sendnotifications.php file to the root or /folder where you have all the twilio files installed. Notice the orange arrow. Here you can add any text you like in order to let the viewer know what they need to do next. In this example I’m telling them it’s now ok to go ahead and close down the browser. Two weeks ago I ran an experiment to gauge how well a hand drawn video would work with a blanket set of viewers. The list of people viewing the video was broad (untargetted), as expected, but what wasnt expected was the large uptake in the number of offers for my video. I had expected the video to bring in a certain industry i.e.e Marketers and web designers, but what I didnt expect was a large number of the requests came from business owners from all types of consultancy roles! For me though, the true way to gauge the impact of that video was to actually incorporate an offer in it. The offer was presented to viewers midway through the video and out of the 90 or so viewers of the video I received over 30 signups to the email address requesting a custom made hand drawn video. Arguably I have nothing to compare this specific video to in order to compare like for like, but what I do have are many other videos with offers in them. No other views per signup videos I have done in the past have ever matched these sort of conversion rates experienced with the hand drawn style. So, for me I’m sold. If you want your own custom video simply follow the video instructions above. Over the past two weeks I have created three blog posts: how to find business leads on Twitter, 3 Uses of QR codes you probably never thought of and How to find business leads on Twitter by location. Each of these posts ended up trending on Linkedin and I believe my 7 steps to trending will work most of the time. But what exactly does trending mean? Essentially the more people that view your post through the use of the special link Linkedin create, the more chance you have of it ending up in the “News Today” section of linkedin. In particular though, it normally ends up trending in a particular area of the news section, typically defined by the industries the people who look at your post are in. In my instance a lot of my contacts would be in the advertising and marketing industry and I would expect to end up trending in that news section. if you’re in an industry tailored specifically to Management Consultancy and most of your contacts and groups are in that industry, then you’ll likely trend in there. In the image above you can see the “Trending in Marketing and Advertising” text. This tells me that, well, my post is trending. So, what are the benefits of trending blog posts from Linkedin members? 1. Huge increase in traffic to my website (obviously, as that’s where the post was situated). Three spikes in traffic and more traffic throughout the next week. As you can see post 1 brought me in over 1000 new visitors to my site – probably 1000% increase in what I’d normally receive in a day. 2. Comments and interactions from people. Some commented on the blog posts themeselces, some commented inside Linkedin by sending me a message, some contacted and connected with me via Twitter and noticeably more connected and commented with me through the Linkedin Groups which is what I will be discussing shortly. 3. Increase in my newsletter optin. 5. Increase in signups to my webinar (strategic movement on my part). 6. Lots of retweets of my posts. 7. Lots of shares of my posts on Linkedin. *I’m sure there are other benefits but these were the main “noticeable” ones for me. So, next I’ll discuss the Steps I took to get my posts trending on Linkedin. 1. Formulate a useful post that you wish to share with the Linkedin Community. This is important because if it’s not useful it simply will not be shared. 2. A catchy but informative subject line is very important. This is what will get people to CLICK on your link. Without these clicks your post will stand little to no chance of trending. 3. Selecting a suitable “good looking” image is vital. If your post Trends, Linkedin will automatically take an image from your post and use it in their thumbnail for your blog post. So, it’s got to be a catchy one. Also, it appears that Linkedin will use the FIRST image to appear within your blog post – so pick wisely and carefully. 4. Be a member of suitably related groups. This is probably the most imporant aspect of this technique. You need to be a member of groups that are interested in reading your posts. The more members that are in your group the more chance you have of getting their attention and having them read your post. Getting into groups isn’t a big thing, but getting into the right groups is. You will need to spend a bit of time researching groups and target groups around your particular post. If you’re providing news related to Real Estate prices in Arizona and you’re sharing this post having joined a group about Car Kit Enthusiasts in Edinburgh then your not targetting your audience. I could write a whole lot more on selecting the correct blog post but I’ll leave you with the starting point of what to do. And, to summarise this step 4 again – look for related groups to your post topic. Ensure they have an active group too, by looking for their activity level when searching for groups. Join Open groups and closed groups. With closed groups you can send a request to join up to 10 groups at any one time, so be aware. Also, you can not be a member of any more than 50 groups. 5. Now we move into the “fun” part of the post and that is sharing the content. I have a Linkedin Share widget on my blog post so whenever I post I share it from within that widget which will share it on my Linkedin Status Updare. However, it will also give me the option to share it with my GROUPS. This is vitally important as I want to share this post with as many groups as possible, all at the same time. So, having a Social plugin allows me to do this. I won’t recommend one specifically to you however there are many out there that will do the same job. Before I forget, ensure to check the Twitter share icon too… (ensure you have set up your Twitter profile with your Linkedin account). 6. Once shared from your blog go back into your Linkedin account and then “Like” the post you just shared. Also, it’s time now to go visit each of the groups you posted to and “Like” your comment in there too. This will help further draw the eye to your post whilst group members are browsing the discussion board. 7. Once every couple of hours go and re-share your post from within your Status Update. It’s best though to check your Recent Activity Stream shortly after posting to spot for the Trending post as you won’t actually receive any notification. These are the main seven steps I take to ensure my post gets Trending on Linkedin, or to at least help it as best I can with Trending. I can’t provide a specific time of the day to post to Linkedin as the three I did were posted morning, afternoon and evening and well we are working with a World Wide Audience. I must stress the importance of targetted groups, sharing on Twitter and answering the questions within groups. If you have done these 7 steps correctly you can hopefully sit back and enjoy an influx of traffic to your website, which you can then monetise how you wish. If you require some help in getting your message read, or wish to consult with me on your post in order to get it to perform as best it can, then contact me on any of the mediums above (Linkedin, Twitter, Contact form) and we can work on these steps in order to get your post trending and traffic flowing. If you’re on Twitter, do follow me. I’m more inclined to help you out if you’ve shared my comments either on Linkedin or Twitter. So, please take the time to share this comment by using any of the share widgets below this post. Last Friday I created a blog post on how to find business leads on Twitter through the use of Hootsuite. 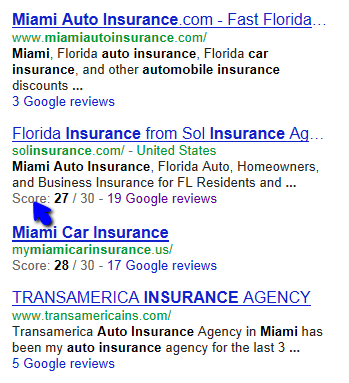 What I didn’t cover though was the ability to search for these leads based specifically by location. So, in today’s blog post I’ll explain how to find these leads on Twitter by location only. Just to recap, I will be using Hootsuite for this method, however, you can just as easily use the “near” input box within the advanced search of Twitter. But for this post I’ll use Hootsuite. Ok, first things first. Why are we looking for leads by location? Welll, simply put, if you were to service these leads it may be of benefit to do so from an area you cover. Some tweets will come in from another continent so tweaking this so they come from your local town/neighbourhood is a better use of your Twitter prospecting time. You’ll need 2 things. 1) geo-coordinates for the area you want to get the tweets from and 2) a radius to work with (I use 25km and works well). I’m going to be using Hootsuite for this demo but you can use any platform you wish that allows for geotargetting tweets. I use Google Maps to get these coordinates. They are very easy to obtain, too. 3. 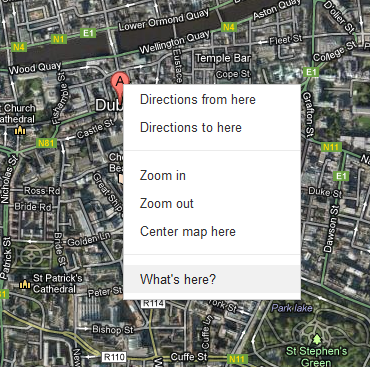 Right Click on the map where your location is Pinned to. Having obtained your geo-coordinates we’ve accomplished all of “hard bits” in getting our location. Next, we log into Hootsuite and continue on with building our lead engine. This part is a doddle. We will use our obtained coordinates to search for leads within a 25km radius. It’s very easy to do so follow along with the steps below and you’ll be pulling in leads in no time. If you are after leads from your current location then you can press that compass symbol to the right (as depicted in the image with the second yellow arrow pointing to it). This will look for your coordinates. All you need to do here is edit out the coordinates and replace them with your own set of coordinates. If you want to narrow the search radius then change the 25km to somthing like 15km. 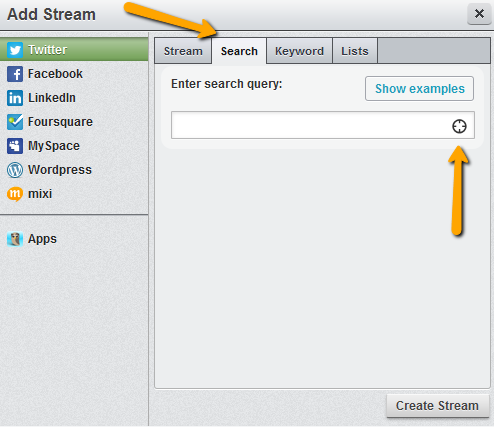 Now press Create Stream and Hootsuite will bring back all the latest tweets that contain “anyone recommend” and located near to your chosen coordinates! If you enjoyed this article, please retweet it and share it with your colleagues. Any chance I’ll get I’ll scan a QR code. Sad, I know. But there’s a reason for it. In this post I am going to detail three ways to use QR codes as either lead generation opportunities to help sell your marketing services or to help aid and grow your business. Each method is unique in its own right, and each carry equal weight to how you would use them. They are not detailed in any particular order. If you’re a business owner looking to grow your business rather than looking for lead gen (i.e. you have a captive audience already) then jump to number 3. Marketing departments are quick to try new methods in order to engage the customer. Sometimes though, they get it wrong. QR Codes are predominantly used to target smart phone users. The problem though is that many marketing depts omit the link between the QR Code and the final result: the web page/info page. When you scan a QR Code you are usually redirected to a website telling you more information about this product and/or service. BUT and it’s a big but, the page you land on is OFTEN not designed for a mobile site, meaning your visitors will have a hard time reading the text and understanding your message. So, look out for QR codes that don’t render onto a mobile browser well. More often than not it’s assumed that the QR code will do all the work. Not so. Your job is to scan the QR codes and see whether they turn to mobile sites or not. If not, you have yourself an opportunity right there. Getting in touch with the business owner can often be tricky however Linkein is very useful for that. Places I look for QR Codes: Product Packaging, Magazines, Shop windows, newspapers and Google Search (covered next). Now, this is not going to be the normal “search for qr codes by country” method. That’s too low brow. We don’t do low brow at InternetMONEY. What I’m going to show you is a method I have used successfully in the past to get in touch with business owners. It’s a Google search that will require some explanation but once shown you’ll be finding your own leads to beat the band (and recession). This particular method will show you how to find restaurants that are promoting their QR codes and they have more than 50 Likes on their page. You will notice food/beverages. This is taken from the business type found on Facebook pages. Yes, we’re using this particular method on Facebook. You can tell that because we have site:facebook.com which tells google to only return results from the Facebook.com site. We have placed “qr code” in quotes. It’s important to do this as these are generally two words used together when a business wants to ask customers to “scan our qr code”. Next important thing is the likes:50.. the two dots after the number 50 are important. It tells Google to return results with MORE THAN 50 likes. Without the two dots you would get results with pages that have 50 likes only. If you want to have results returned with more than 100 first, then change it to likes:100.. and so on. So now you’ve got a list of results of pages that have over 50 Likes on them, are restaurants, and they mention the word QR Code on their page. All you need to do now is scan their QR code with your phone and see does it return a mobile optimised site or not. If not, drop them a message directly from their Facebook page. I’ll keep what I say private. You’ve got 90% of the method there. 3. Growing your business with QR Codes! This method I like. I think it’s so clever and smacks of “why didn’t I think of that?”. This method will work wonders to help you grow your mailing list. I am of course talking about the digital variety of mailing lists and not customer addresses. What you need is a QR code that will translate into an email address once scanned. That’s right, you can get QR Codes that will convert and trigger a mailto link and pop open your default mail client on your iPhone. You’ll need two things. Your mailing list email address and a QR code. I use Getresponse for my autoresponder mailing list and find their support great and features perfect for my needs. You will also need your mailing list QR code, which can be obtained here. Simply click on Email address and enter your mailing list email address in the input field. Your QR Code is now ready. So, let’s recap where we’re at here. We have created our mailing list email address and converted it into a QR code. You’ve then gone and downloaded the QR code so as you can print it out and display it prominently around your store. But, where does this all lead to? Do me a favour. Go ahead and scan that QR Code there for me (the one in the image above). If you’re on an iPhone it should pop up your email client with your default email address in it. Now, press Send. You will shortly receive an email from my autoresponder asking you to confirm your optin. If you are a restaurant owner simply have table stands with your QR Code printed on them and you have a captive audience ready to scan your image. The beauty is those who know what one is will often scan it! Once they scan and opt in they’ll be opted into your mailing list and you can now market to them through the use of email marketing. I’ve talked about this method at length, heck I even spoke about it at the Warrior Gathering in London. I’ve even explained it on training courses. However I’m still not seeing people using it! Here’s a screenshot of one of my streams from within Hootsuite. What you see there is a summary of what I have included in my stream search parameters. It’s very easy to set up and that link above teaches you all about streams. This post isn’t to educate you on streams, it’s to teach you a technique to help you find business opportunities on Twitter. So, just how do we go about using Twitter to find business opportunities? Because my search included “anyone recommend” and my location is set for a specific coordinate and @PhotographyCamp is in or near these coordinates then it returned their tweet to my stream. Now, if I were a bouncy castle provider I would have set up these alerts in my Hootsuite platform (or have someone do all this for me). So when that tweet came in I would see it in my stream and could reply accordingly. It is important that you act on these tweets quickly. I’ve found that someone who asks for a recommendation on Twitter will often also turn to a Google search to seek out their requirement. So, set up those searches and monitor them daily. You don’t want to let leads slip you by. Do you need to use Hootsuite? Of course not. There are plenty other platforms out there that will do similar functions for you. Hootsuite has grown on me and I like the features they have available from within the platform. A big plus is that it is also web based meaning I can jump from machine to machine to VPS etc. Their iPad app is ok too. It’s only when you’re working for yourself and serving your clients that you can fully appreciate the value you can gain from attending events and seminars that are industry specific. 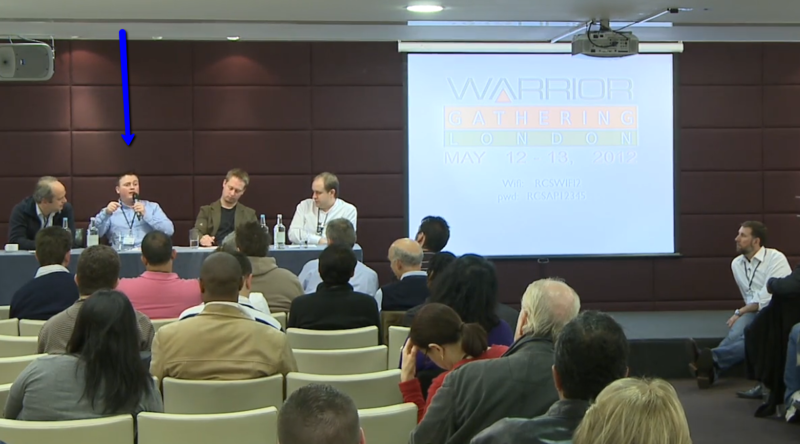 I recently attended a two day seminar in London aimed at online marketers. Now, a lot of my work would stem from/is born out of working in the online marketing arena and then I adapt these core skills to suit the marketing needs of a local business, whether it be for online or offline. That’s me onstage sitting under the blue arrow. In that scene I’m talking about how I used Twitter to find an “angry” customer of a service provided by a particular company. There appeared to be no reply from said company so I dropped them a line giving them a “heads up”. This email led onto a conversation and subsequent meeting. I have since received a dozen emails from people who attended that weekend event thanking me for sharing the method but also that some of these have gained some traction with the method! Good for you. I know of at least a half dozen times during that weekend that I gathered some really useful marketing ideas for my business. Even though the event ticket price may run into the several hundreds of dollars to attend, the value you get from it and the people you meet and connect with will be worth thousands of times more than the cost of entry. So, if you get the chance to attend these industry specific events, do so! So today I was investigating the reasons why some components of MapPI were returning results and the average rating wasnt coming back. As MapPI requires Internet Explorer as its backbone in order to gather its results it relies on the browser staying as passive as possible. 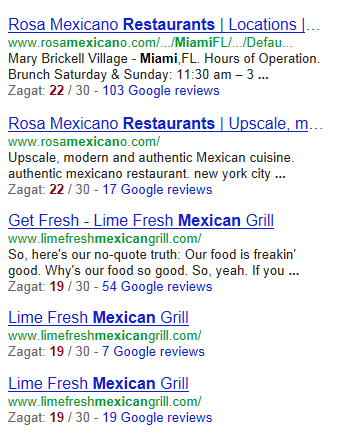 However, recent changes at Google has seen the addition of Zagat in the Google Places serps. Not a bad thing considering Zagat brings in reputable reviews from registered customers and Google seems to like that. I mean, why reinvent the wheel eh? Great news for Zagat and restaurant owners alike. Now you may be wondering why can’t you see any of these reviews. Well, the answer is simple. It’s probably because you’re not using Internet Explorer. 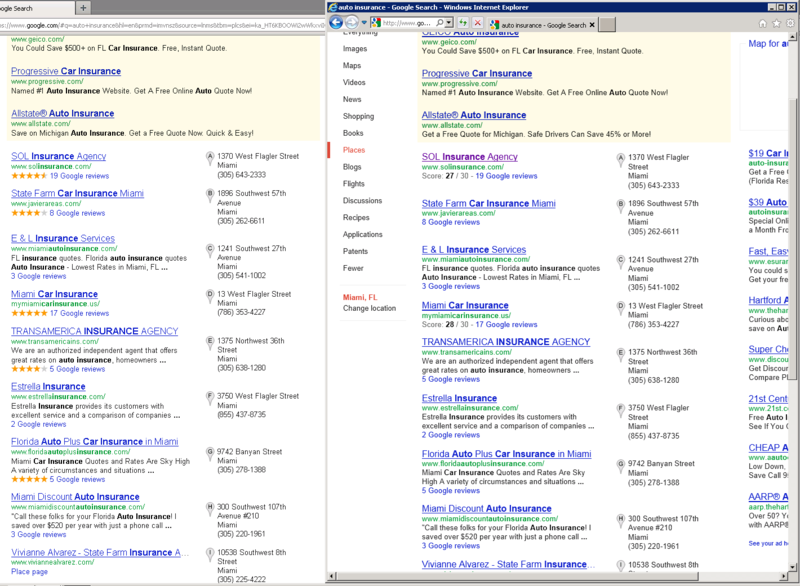 Here’s a dual screenshot of the same search done on Firefox and Internet Explorer 9. So, when you’re explaining “the score” to your clients, be sure to take into account that they may or may not be using the same browser as you. It seems now that the same results now appear for all the browsers. Get on my newsletter list to receive free software tools and notification of latest posts.